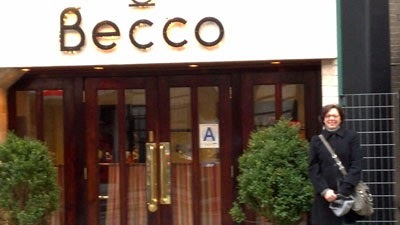 Becco, or as I can now refer to it as my new favorite Italian restaurant in New York City. 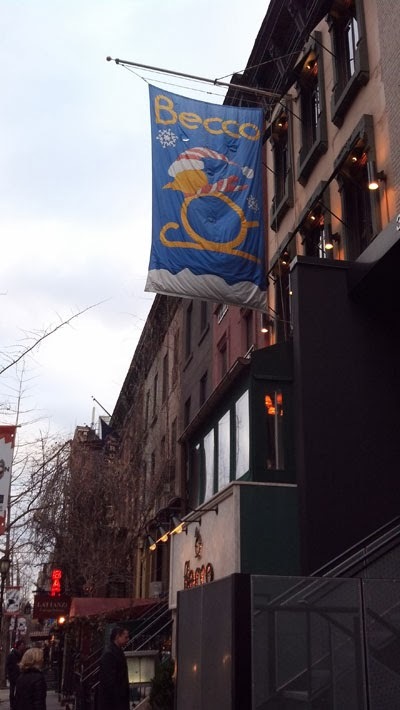 Chris and I went into New York today for a show at B.B. King's, The Smithereens. Yes they are our favorite band. We wanted dinner before the show so Chris picked Becco. We had 4pm reservations, the Smithereens concert started at 8pm so we had plenty of time. We had to wait in the bar to be seated. The walls of the bar where lined with pots and pans that looked ancient. There were shelves lined with what looked like carrots and berries of some kind that had been put up. They reminded me of my parents little cellar. We sat in the back dining room. The tables were close to each other but we ended up talking with our neighbors on both sides. It was a very casual and comfortable atmosphere. We started off with cocktails. Bread and bread sticks were put on the table. 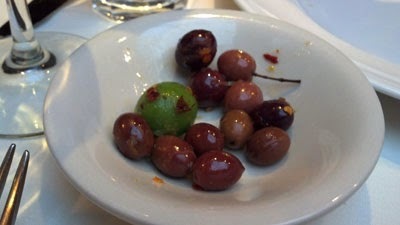 A dish of olives and a dip made with cannelini beans were also on the table. 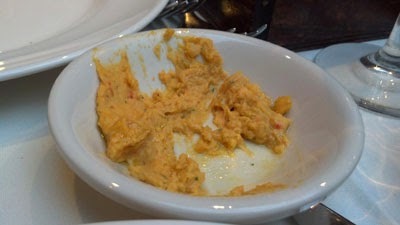 We made quick work of the that dip. We had Caesar Salad. (The photo I took was very blurry). I use Lidia's recipe for Caesar Salad when I make it at home. But the salad they served tasted so much better, probably because I did not have to clean up anything. The appetizers were next. 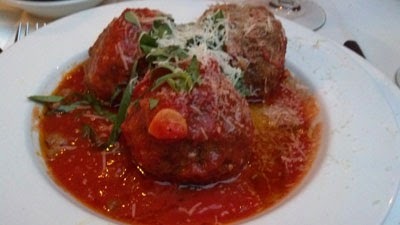 Polpette di Manzo. 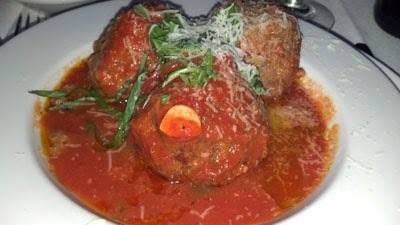 House-made all beef meatballs in “Sunday Sauce”, finished table side with grated Grana Padano. Oh my God. A plate of these with some bread was all I needed. They were cooked perfectly and were delicious. We asked if they could be FedExed to our home. We also tried the Arancini, Rice Balls. I have to say they were disappointing, rather bland. But the meatballs made of for them. Dinner. I had a special, Braised Short Ribs. (The photo I took was very blurry). They were served with Butternut Squash and sauteed Swiss Chard. 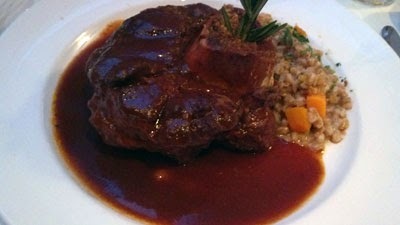 Chris had the Osso Buco alla Becco. Where to start.... Both dishes were very good. Fantastic. Delicious. As I am typing this my mouth is watering. The marrow from the Osso Buco tasted like it was flavored with rosemary and parsley. Mind blowing. Absolutely mind blowing. 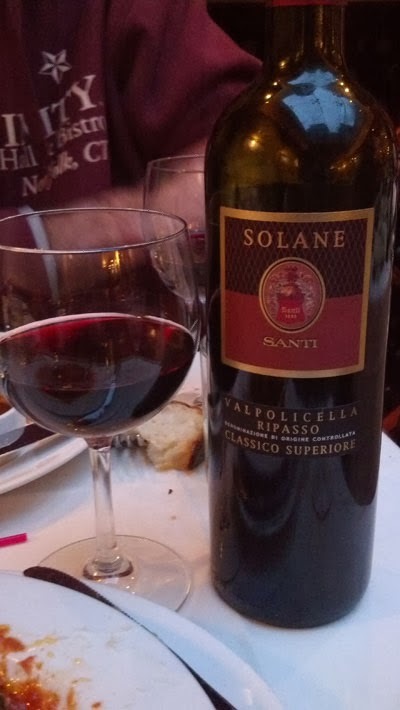 The wine was my selection, I checked the wine menu online the other night and did some research and narrowed down our selection to 4 bottles. Chris did make the final choice. It was a perfect match with our meals. We passed on dessert, but I did have a piece of Key Lime Pie at B.B. King's, sorry no photo.